Beth & Cory's Mom: Are You Really Getting a Good Deal? Anybody who knows me at all knows that I love a good deal. Paying full price for anything is practically against my religion! I believe in combining sales, coupons, rebates, and whatever else I can in order to get the best price possible on whatever I buy. Clearance is one of my favorite words! I especially love when things are marked 80-90% off regular price. Just 25-30% clearance isn't really good enough. Just because something is 'on sale' does not necessarily mean that you are getting a good deal. It's important to have at least a general idea of the regular prices of items you normally buy. This is especially true of groceries. Many times I have seen a sale price advertised in the grocery ad for an item that I bought at a cheaper price the week before. But, if you don't know what the regular price is for that item, you might think you're getting a good deal - because it's on sale, right? Knowing the regular price will help you know when you do see a good deal, and that's when you buy. If it's something you use on a regular basis, buy several when you get it at a good price. The idea is to buy enough when something is on sale so that you won't run out and have to buy more before it goes on sale again. Combine sale prices with coupons and rebates using cash back apps like Ibotta and Checkout 51, and the savings can really add up. Just remember - if you don't need it, all the coupons and cash back rebates in the world don't necessarily make it a good deal. Unless it's free. Free is always a good deal. (at least in my opinion) If it's something you don't really need, consider donating it to someone who can use it. A money-saving option that I haven't really explored is renting items that you may only need for a short time. Of course, this doesn't apply to groceries, but renting sports equipment for things you only do occasionally is often the best option - at least until you decide to take up that sport on a regular basis. And f you're planning to welcome a baby into your family, you may want to check out baby gear rental Florida for baby items that will only be used for a short period of time. Renting tools from the local home improvement store for that one-time project instead of buying a tool you're never going to use again is also a good idea. Invest in items you can use for a significant period of time, and have room to store when you're not using them, and rent other items. Just be sure to do your research first. Find out how much it would cost to purchase the item then compare that to the cost of renting that item for the time you need it. The bottom line is - arm yourself with knowledge. 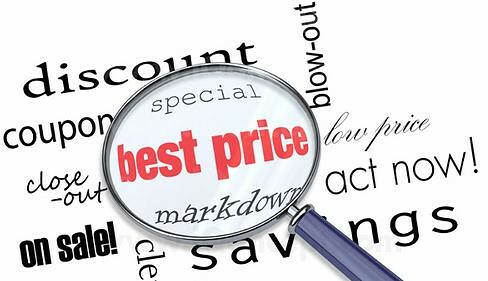 The more you know about how much something should cost or will cost over the time you will use it, the better equipped you will be to know if you are indeed getting a good deal. Remember your smartphone (most of us have those nowadays) and look up prices on Amazon or other retailers - yes, even when you're in the store - to see if you can get cheaper somewhere else. Some stores will even match those online prices, so don't be afraid to ask.